Hi there! I’m Yuna and I’m a blogge– wait I already started this blog? Oh yeah, that’s right. I haven’t posted in what seems like forever. I have a lot of recipes to post, but I couldn’t find the time to write and post. A friend’s birthday did pass within these past few weeks! Which means… I baked something quite unique! I didn’t have many of the ingredients needed for this recipe, so I ended up spending $30 to make this single pie. So for those of you trying to make your friend an inexpensive present, this probably isn’t the first place to look. Unless, that is, of course, you have cool whip, pie crusts, caramel, pecans, and peanut butter lying around your kitchen. oOooOO look at that caramel-y chocolatey deliciousness. Beat together the cream cheese, sugar, and peanut butter. Toast the pecans for around 3-4 minutes on your stovetop. Add whipped topping and half of the toasted pecans to the cream cheese mixture and blend well. Spread some caramel ice cream topping on the graham cracker/oreo cookie crust. Spread the cream cheese mixture on the crust. Take out the pie and spread the rest of the pecans over the top. 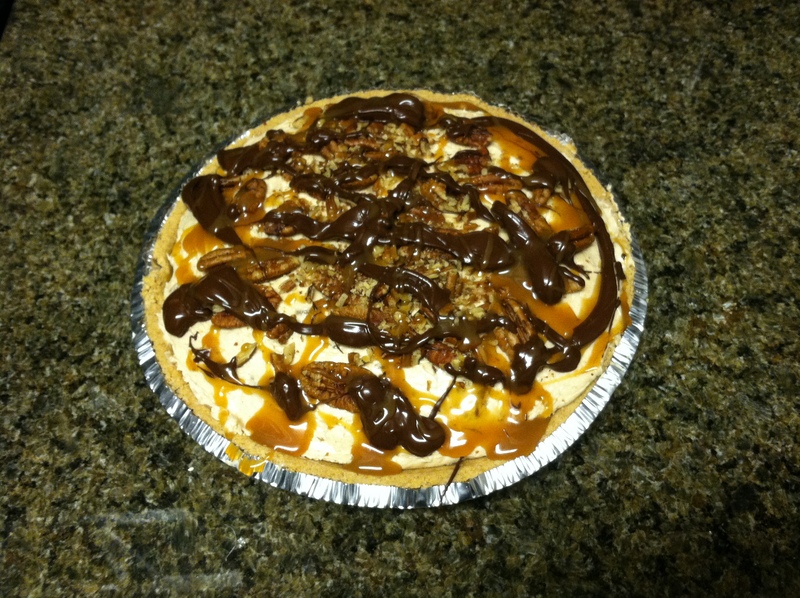 Melt some chocolate and drizzle it on the entire pie. Drizzle as much caramel as you’d like. Freeze again for 1 hour. Serve and keep frozen when not being eaten!